Berlin has a great Jazz scene with a whole stack of live music around the city. 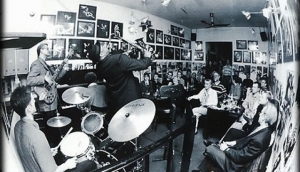 From old school jazz, new orleans jazz, fusion, or experimental stuff there is nothing like sitting in a dark bar or club and foot tapping along. Check out My Destination Berlin for all the best places to go to hear some of the coolest live jazz in the city. Solo artists and bands from around the world appear at Berlin’s best jazz music venues and repeatedly come back for return performances. Swing, blues, big band or modern jam sessions, Berlin has it all for your sensory Jazz music experience. If rockabilly, western swing, hot jazz or rock and roll are more your cup of tea, there are also a number of places in Berlin catering to those styles too. Enjoy swing, lindy hop, balboa or blues dancing. Berlin is a mecca for dancers from around the world with swing dancing events happening pretty much every night of the week.